Contingent capital is a type of converging product that combines capital and insurance markets. It is the most obvious example of the combination of risk management and a financial instrument. Subprime debt, preferred shares, surplus notes, and priority debts are forms of this type of ART solution, which, in turn, if applicable, has similarities with the basic structures of a particular sales option of the purchasing company. Contingent capital made its mainstream appearance in the market around the mid-1990s. The increase in demand for Contingent Captial products has also mainly occurred during a hard insurance market. If personal insurance is more attractive, the purchase price of the insurance coverage increases. Since it bridges the gap between full personal insurance and comprehensive insurance, contingent capital is a hybrid solution, so to speak, that provides capital at a price, rather than full coverage for damages. The following example of a fictitious producer of a major beverage shows the benefits and strategy for the company as well as for the insurer. If the demand for beer and soft drinks in Asia and Central America were to dramatically decrease, the company would run into financial difficulties. The cost of borrowing credit would rise and the creditworthiness of the company would decrease when it reports a decline in sales. For access to capital in the event that a contractually agreed upon event is triggered, the company enters into a conditional capital deal. Low growth in gross domestic product in two regions (Central America and Asia) is defined as an event to the extent that it is correlated with the sale of soft drinks and beer in order to counter the risk of moral hazard. The insurer and a bank syndicate grant the beverage manufacturers 750 million US dollars in capital in the form of a loan at a predetermined price, if and when a weighted average growth for the two markets falls below a fixed point. Because the risk of moral hazard through the use of the GDP trigger is reduced and the insurance company receives an annual fee for the assurance of providing capital at a predetermined price, it is a good product for the insurance company. The value of this approach for the beverage manufacturer is obtaining an assurance of capital from insurers at a price lower than the fee of a traditional insurance solution. Because the banking syndicate has agreed to provide the capital, the price for this is low. The full amount for damages is, however, not paid with an insurance contract. To be able to continue to finance acquisition opportunities without causing a dilution effect is a clear benefit for the company itself, in addition to the assurance that in the event of a prolonged economic downturn, an additional layer of non-watered capital would be available. Because the company is not permitted to retrieve the money at its discretion, it will also allow the use of the GDP trigger. At the same time, the banks and insurers are able to offer a significantly lower price than (provider) banks of similar loan commitments. 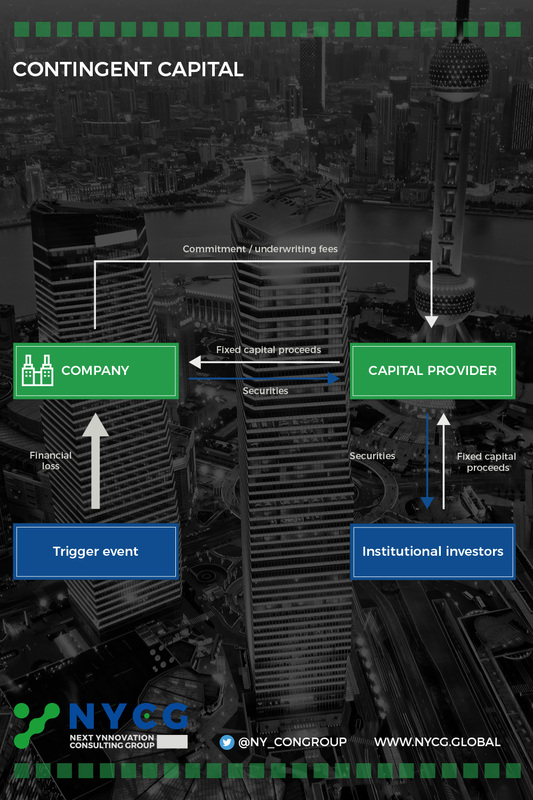 Contingent Capital can be practically used to hedge profit shortfalls in major markets, such as for beverage producers. The protection against fatal, albeit rare, loss events, such as earthquakes and floods, is also possible. The literature does not provide a clear definition for finite or limited risk insurance, possibly because some forms of limited programs occur in the market. Limited risk insurance can be offered by the reinsurer to the insurance company, and it can be concluded between a reinsurer and an initial insurer. This tool is offered to them notwithstanding the customers of the primary insurer. Adverse development coverage (ADC – protection of an unfavorable development) and loss portfolio transfers (LPT) are the retrospective versions of finite risk insurance. In the following analysis, the process between the company and the insurer will be considered in more detail. The finite risk solution is based here on the individual policyholder, rather than, as in the traditional insurance approach, being based on the law of large numbers, i.e., a large number of policyholders. Although there is no clear and distinct definition, there are unique, identifiable characteristics in each individual risk contract. Risk transfer from the company to the insurer’s almost is quite limited, however, the insurer also takes non-insurance risks (e.g. currency and interest rate risk), in addition to traditional risks (such as property and casualty insurance). Such contracts usually extend for five or ten years, although there are contracts for even longer periods of time. Costs now depend on individual loss experiences. Statistics in recent years, or from the time when the company was covered by traditional insurance, provide the necessary information. The insurer reimburses unnecessary premiums (positive property / premiums ratio) at the end of the contract term. Finite risk solutions can be used for different reasons. From a business perspective, this ART tool could be used for providing relief from the mergers, acquisitions, and closures of businesses. LPT can help to relieve companies of long-term liabilities. ADC, e.g., can be suitable for a brick manufacturer that falsely mixed the raw materials of a particular batch of bricks or whose bricks lose color over time, even if the exact loss to the company is uncertain as not all of the bricks are affected. In such a scenario, the application of ADC is advisable. Large companies, in-house insurance, and primary insurers are among the customers of retrospective (re) insurance, although smaller companies are also potential purchasers of the ADC solution. The predictive solution is primarily used by large corporations and insurance companies. The Iron Mountain Harper Mine is a superfund site in Riverside, California, owned by Z Management Co. of Trenton, New Jersey. Z Management is the sole potentially responsible part (PRP) under Superfund, which generally holds any PRP to a superfund site jointly and severally liable for the entire cleanup costs of that site. Z Management became the PRP to Iron Mountain because it manages the assets and liabilities of the former company, which acquired Mountain Harper Ltd. in the 1960s. It was Mountain Harper´s mining operations above- and below- ground that fractured Iron Mountain, creating the Superfund liability by exposing the mountain´s mineral desposits to oxygen, water, bacteria and thereby generating substantial acidic runoff. Mining operations ceased at Iron Mountain in 1963, at which time the federal government developed the Spring Creek Debris Dam to control the release of acidic water runoff from the mine. The Environmental Protection Agency (EPA) listed Iron Mountain as a Superfund site in 1983 with Z Management as the sole PRP responsible for its cleanup. Eleven years later the State of California and the EPA concluded that the dam was not enough and ordered Z Management being removing all the contaminants for the water. 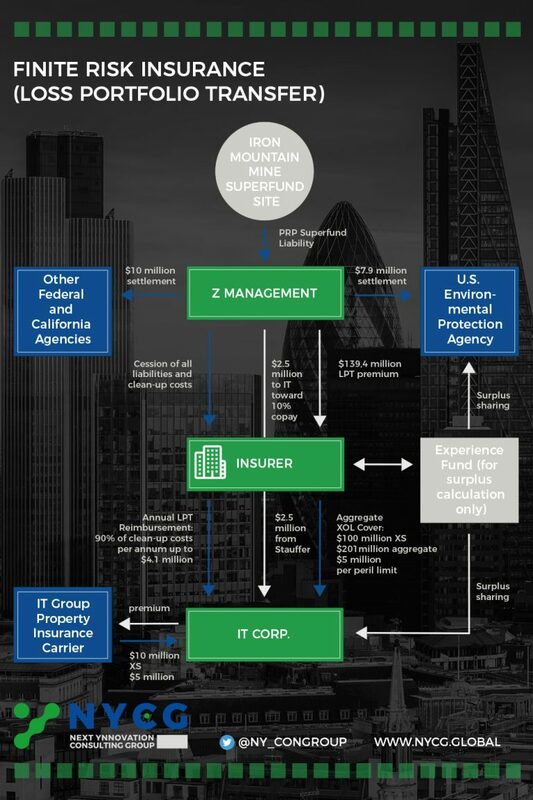 In 2000, Z Management, settled its Superfund claim with the EPA and several other federal and California agencies for future regional environmental improvement projects, and 139.4 million was the premium Z Management paid for a finite risk LPT obtained from an insurer. Under the LPT agreement, the parties have agreed to contract IT Corp. for the actual cleanup of the Iron Mountain site. The parties estimated the cost of cleanup to be about $ 4.1 million per annum over the next three decades for an inflation-adjusted total of about $ 201 million. Under the finite risk policy, Z Management cedes all of its past, current, and future liabilities on the XY site to the insurer along with the finite risk premium. The premium payment of $ 139.4 million was funded by Z Management out of its current cleanup reserves for the site, plus some insurance coverage under prior policies. The LPT agreement then obliges the insurer to reimburse IT Corp. for 90 percent it’s the actual cleanup costs incurred each year on the Iron Mountain site up to a maximum of $ 4.1 million per year. IT Corp. bears the risk of higher annual cleanup costs subject to two other protections. First, if inflation causes and increase in costs by up to $ 900.000 in a single year, IT Corp. can carry forward that additional cost into a subsequent year in which costs are below $ 4.1 million. Second, the insurer also provides the IT Corp. with $ 100 million in aggregate XOL coverage for cost overruns specifically triggered by catastrophic perils such as excessive rainfall or earthquakes, subject to a $ 5 million limit per peril. IT Corp. must finance the remaining 10 percent of its actual annual cleaning costs as a copayment on the finite risk policy, although Z Management agreed to prepay in a lump sum approximately $ 2.5 million to IT Corp. that it can use toward its 10 percent residual copay requirement. IT Corp. bears all of the timing risk on how that additional 10 percent in costs is accrued as well as the timing risks on the clean-up costs themselves. In return, the finite risk policy includes a type of experience account in which IT Corp. retains some of the surplus if aggregate cleanup costs fall below $ 201 million over the next 30 years. The EPA receives another portion of that surplus, if it exists. A captive is a component of risk management structures or solutions with the participation of insurance and / or reinsurance undertakings that enable businesses either to finance or transfer some of the risks to which they are exposed in non-traditional ways (by relying on international personal insurance, combined in innovative ways with external reinsurance support) and thus they act as synthetic debt or equity in the capital structure of enterprise customers. 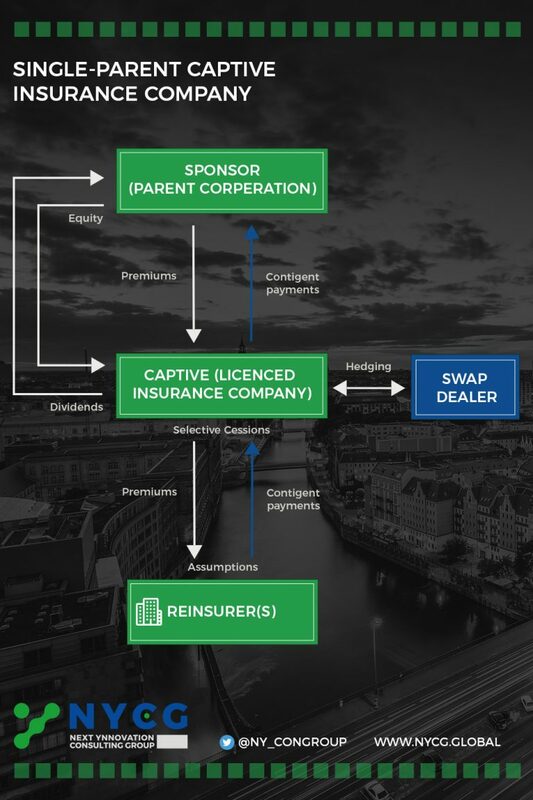 One risk management technique that companies can use is to form their own insurance company in order to finance the balance of losses within a formal structure, which thereby makes use of captive insurance. Independent auditors, local representatives, lawyers specializing in corporate law and regulations, insurance consultants, risk managers, accountants, actuaries, and other experts should be involved in the design and pricing of the insurance coverage of the captive insurance. Even the largest companies transfer their captive insurance activities to a third party for this reason. Nowadays captives are used as a tool for risk management in middle market companies. Adidas is a well-known sporting goods manufacturer that formed a wholly owned captive insurance company in 2002, which is based in Dublin, Ireland. The captive´s purpose, like most others, is to improve risk management and better utilize the group ́s financial resources. The reason why Adidas is mentioned is that they list all their subsidiaries in their annual reports. In the first year of business, their captive insurance company was only about the 70th largest subsidiary out of a total of 115 subsidiaries. The equity of the captive in 2003 was a little more than one million euros. This shows the relatively small size of the captive compared to the group, which has about 1,300 times the equity of the captive. This indicates a low importance of the captive insurer to the parent, and thereby provides a sign that the risk management of the group may not be influenced significantly. Since its formation in 2002, the captive has not been mentioned in the group ́s annual reports, which is another indication of the minor influence it has. Despite this, however, the captive showed impressive growth figures. It started out with equity of only a little more than one million euros in 2003, but two years later, the size had increased about six times to an equity of EUR 6.37 million, or around 50th largest, and one of the fastest growing, subsidiaries. This shows that despite the small size and the lack of reporting, the captive is being well used by the Adidas group. However, no specific influences on the group ́s risk management can be pointed out because there is no information about the captive´s ongoing business, nor is there any financial data regarding the captive available. Finally, it can be said that it is very difficult to find information about captive insurance subsidiaries. Consequently, it is difficult to find out where exactly the influences on the parent´s risk management are. A point of critique about the sample of companies can be that only large entities have been chosen. A small captive subsidiary is of low importance to them, and consequently, information is held to a minimum. Since only publicly traded companies publish annual reports or risk management reports, it is not possible to get hold of information about the captives of small entities at all. Researching more companies in general would not make much sense, as the results are not likely to change, unless a company that gives away more information about their insurance program and their captive is found. This possibility, however, is very small, and it did not happen when companies for analysis in this work were chosen. Even in the event that such a company is found, it is questionable if influences can be more specifically pointed out, and it is doubtful that these influences apply in general rather than just to that specific company. Case Study: Denso Corp & World Air Holdings, Inc.
Based in Japan, Denso Corp. & World Air Holdings, Inc. is a worldwide operating supplier of advanced technology, systems and components to major car manufacturers. In March 2006, Denso decided to found a captive, located in Hawaii, U.S.A., which went into business in April 2006. World Air Holdings, Inc. is a holding company for two US-based airlines and a captive insurance company located in Bermuda, which was formed in November 2004. These two companies are mentioned together because the main purpose of their captives is the same – strengthening their risk management. Each captive insurance company was created to provide insurance cost savings, enhanced risk management programs and better loss control practices to their parent ́s risk management departments. World Air Holding also sees opportunities for growth through their insurance subsidiary. Interestingly, although their captive is located in Bermuda, it is reported as a taxable entity in the United States. One of the theoretical impacts was that a captive brings risk management to senior executives, and thereby increases its importance within the organization. Denso provides a good example because their captive´s president is the parent managing officer responsible for Audit, Corporate Planning and Corporate Communications. Case Study: Allied Holdings Inc.
Allied Holdings, Inc. is a company based in the USA. It is the parent of several subsidiaries whose businesses provide distribution and transportation services to the automotive industry. Allied Automotive Group, Inc., one of the two subsidiaries of Allied Holdings, retains substantial portions of its risks. For example, in 2002, they retained 650,000 USD of liability for each workers compensation claim and up to 500,000 USD for automobile and general liability, along with several other retentions. On top of that they established a captive insurance subsidiary in December 1995 in order to provide reinsurance to its licensed insurance carriers. Risks to be reinsured in the captive are primarily non-self-insured risks within their retention. On one hand, this means that if Allied Holdings is faced with higher than expected accidents, it would thereby have a significant negative effect on its profitability. On the other hand, insurance and claims costs, despite a contracting insurance market, can be kept down to around 5% of revenues.